The final novel from a great American storyteller. Donal Cameron is being raised by his grandmother, the cook at the legendary Double W ranch in Ivan Doig’s beloved Two Medicine Country of the Montana Rockies, a landscape that gives full rein to an eleven-year-old’s imagination. But when Gram has to have surgery for “female trouble” in the summer of 1951, all she can think to do is to ship Donal off to her sister in faraway Manitowoc, Wisconsin. There Donal is in for a rude surprise: Aunt Kate–bossy, opinionated, argumentative, and tyrannical—is nothing like her sister. She henpecks her good-natured husband, Herman the German, and Donal can’t seem to get on her good side either. After one contretemps too many, Kate packs him back to the authorities in Montana on the next Greyhound. But as it turns out, Donal isn’t traveling solo: Herman the German has decided to fly the coop with him. In the immortal American tradition, the pair light out for the territory together, meeting a classic Doigian ensemble of characters and having rollicking misadventures along the way. 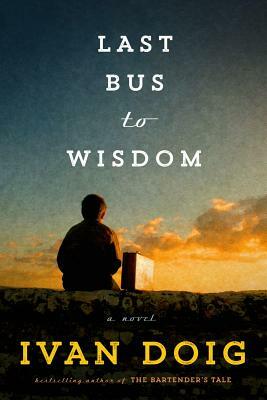 Charming, wise, and slyly funny, Last Bus to Wisdom is a last sweet gift from a writer whose books have bestowed untold pleasure on countless readers. Ivan Doig was a third-generation Montanan and the author of fifteen previous books, including the bestselling The Bartender’s Tale and The Whistling Season and the classic memoir This House of Sky. He was a National Book Award finalist and received the Wallace Stegner Award, among many other honors. Doig lived in Seattle with his wife, Carol, for many years until his death.